Module based on 9200 block of Brookfield Avenue in Brookfield, IL. 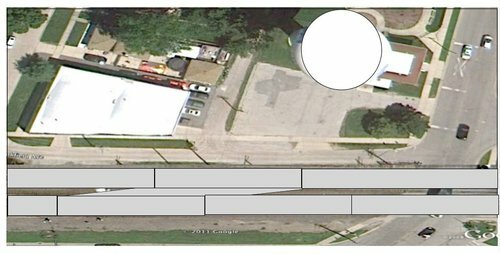 This location is on the former CB&Q triple-track "race track" that provides suburban service through the western suburbs of Chicago. The track work is reduced to double track for T-Trak. The crossover is based on the prototype. Plan view of module. Module is 300mm deep double width. Actual crossover is just east of here (9100 block). Water tower and pumping station at upper right are signature structures in Brookfield. Gray rectangles represent pieces of Unitrack.